The Book of Mormon geography and map with DNA evidence and the location of lands and cities such as Zarahemla, Cumorah, the narrow neck, Mexico, Caribbean sea, American Indians, and true evidence are all here. The Book of Mormon geography lands and map with DNA evidence; definitive truth, is a scripture based Book of Mormon geography book and is not limited to Mesoamerica or some very small isolated land at the Great Lakes or central USA. This book locates everything from the narrow neck, to Zarahemla, from Cumorah, to the Land of Promise, Bountiful, and more. All are located with maps in this true version of the information with evidence and DNA info. This correct Book of Mormon geography evidence was written by Peter Covino, Jr. from personal study with the basic information given to him by Virginia Elieson. 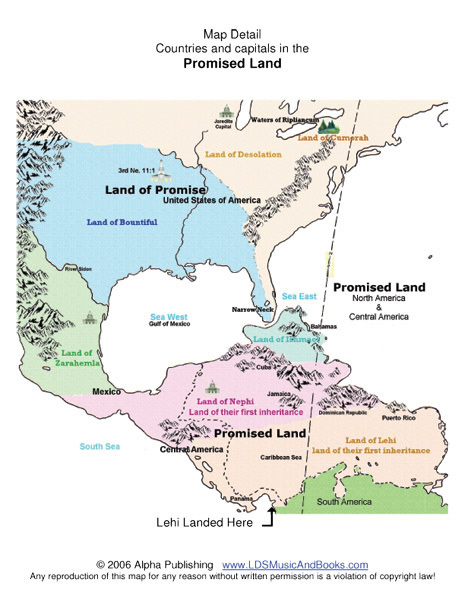 The book “A Promised Land, The Land of Promise”, includes several maps which are available at www.LDSMusicAndBooks.com and a FREE appendix is also there showing what is fact along with several references for external proof like DNA and archaeological facts for those who need more than internal evidences. With the many theories about the location of the Book of Mormon lands, it is interesting to note that this map is the only map that hung in the offices of the church for over 20 years. Just as all religions can not be right, so all settings for the Nephites can not be right. This is the only geographical setting that actually works while you are reading and following the Book of Mormon and is in agreement with what the prophets have stated. All others run into a problem sooner or later that cannot be explained or resolved and are only postulations and are in contradiction to the prophetic statements and flow of events. They use conjecture or suppositions but not actual facts. Or in the words of President Joseph Fielding Smith, “It is preposterous” to believe that the Nephites did not live in the United States. However they did not live in a small spot in the USA but rather the whole nation as is proven without question in this book. There are those who have tried to say that this Book of Mormon map is incorrect. They misquote the contents of this book and assume their analysis is more correct. I suggest you look at the facts list which is a FREE download and see for yourself. In personal discussions with many of those opponents, they have all failed when confronted with several of these facts and they have been shown how and why their layouts do not work. They then give up communicating with us. It is interesting to note that when Alpha Publishing first published this book and map in 1986, NO ONE, except several of the general authorities, (who had this map hanging in their offices), agreed with it. Not one person had ever questioned the Central American setting senario! Now with overwhelming evidence from DNA, scientific findings, and archaeological sources, others have begun to promote a new scenario for a setting in America which has shown this to be the most accurate map. Many now have agreed with it and most members who look at the limited Mesoamerica ruins now recognize that they are not Nephite ruins as Hugh Nibley has also said in the church Sunday School manual, years ago. However this one map is still the only correct geography. Not limited to a few hundred miles of land around the lower Great Lakes or just mid-America but as Joseph Smith said, from coast to coast as he knew the two oceans. I do not offer tours to promote my endeavors and to sell books. It is here for you to better understand the scriptures as you read them, not to make a profit off of non Nephite ruins in Mexico or other locations. The Book of Mormon geography book, “A Promised Land, The Land of Promise” is available at www.LDSMusicAndBooks.com, and uses the ‘Book’ to show The Book of Mormon geography along with prophetic statements. Once the prophets have spoken, there are no other options, and they have. Many try to prove the Book with archaeological finding. That only proves a people lived at a place, not who they were. As more archaeological evidence and DNA is uncovered, more of this version of the geography has been vindicated and exonerated. 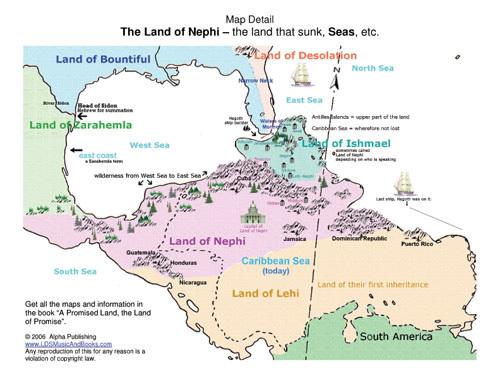 This is the record of the Nephites and their journeyings and not an analysis of the archaeological findings left by the apostate Lamanites, Jaredites, or some other unknown group which others have used as a basis for their geography. 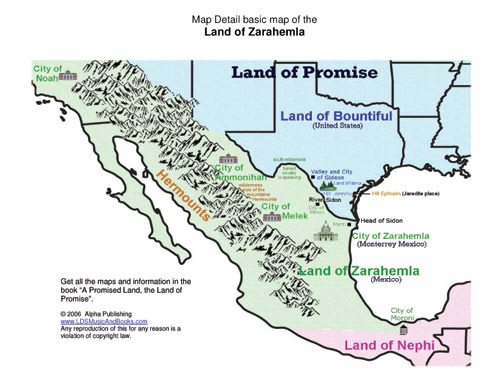 The Nephites did not live in Central America other than shortly hafter they arrived here; they lived primarily in Bountiful and Zarahemla, the United States of America and northern Mexico, which is where the Jaredites lived, and Adam and Eve and their posterity, (according to President Benson). If you follow the fact sheet you will soon realize that no one else’s map follows the facts or the prophets. This Book of Mormon geography and lands is very different from all other published books on the subject of Book of Mormon geography. It is more correct than the others with limited geography which is in opposition to the revealed word and newer discoveries. Joseph Smith and other prophets of our day have all written and or spoken in conference about where the Nephites, Jaredites, and Adam lived. When they speak, it is the word of God. To suggest otherwise is practically sacrilege, yet many have disagreed with our prophets. Too many assumptions have to be made in order to support other theories. In this book we present evidence to support our theory. We think it is a fascinating, viable possibility, and more probable than the other theories that are presently out there. We hope you will look at the maps and evidence carefully and draw your own conclusions. It is not possible to read The Book of Mormon and follow these maps and not realize it is true and realize everything fits perfectly. Many make false statements as to what the book states in order to promote their ideas. These facts, however cannot be disputed. See the FREE download on the FACTS; (available at www.LDSMusicAndBooks.com). Those who write and say it does not fit this or that scripture, lack understanding of the scope of the scriptures they are using. If you read the book and follow this map, everything fits, that cannot be said of any other map. This book is a large geographic setting like no other book available. The Book of Mormon geography book, “A Promised Land, The Land of Promise”, is one of our books at Alpha Publishing available for purchase at www.LDSMusicAndBooks.com. Virginia Elieson was inspired with this geography, while with her patriarch husband and mission president in Dallas. It is here organized into a book by Peter Covino, Jr. 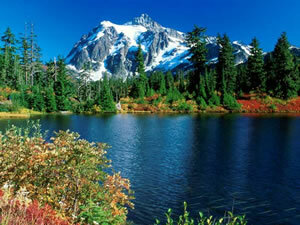 There is nothing like this available anywhere, it will surprise you. Because it contradicts many “church scholars” who adamantly disagree with the prophets, the main stream book stores have refused to carry it even though it has been in print since 1986. A definitive scripture based statement and treatment of geography as it was in The Book of Mormon days, including many maps detailing exact locations, backed up by prophetic statements. This book has been published since 1986 by Alpha Publishing at www.LDSMusicAndBooks.com. All of the most prominent locations of The Book of Mormon lands can be and are located in the book. The index is available as a FREE download (available at www.LDSMusicAndBooks.com). It is a brief summation of the definitive statements of fact which can not be disputed, repudiated, ignored, discounted or excluded, (as all others have done), in their search for truth. In Defense of Truth formerly published as The Day of Defense, is another great book published by Alpha Publishing. It is the fictitious story of two missionaries on trial. The plaintiffs are the Christian clergy and as the judge, a Jewish Rabbi. Every obstacle of doctrine that can be conceived is brought up and answered. A good index enables you to look up specific anti-LDS points with the correct if not the most appropriate answer. The appendix is a summery of what you must do to be a prophet. Using as a basis for this appendix was a list which Bruce R. McConkie introduced. It has been added to and increased with many internal evidences that support its divinity. This has been a great tool as a source of information for missionaries around the world for over 40 years. In Defense of Truth, formerly The Day of Defense was made into a movie, (not conceived well). 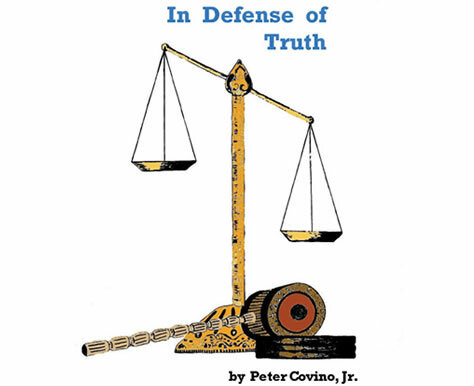 The original book edited and published by Alpha Publishing has been rewritten and is now published as In Defense of Truth. Peter Covino, Jr. added the original and current index, appendix and original cover design. The appendix is also published (available at www.LDSMusicAndBooks.com) for FREE as Revelation or Fabrication – Challenges of the Book of Mormon. Find out more about composer, conductor, arranger and writer, Peter Covino, Jr.
All types of music for choir, orchestra, solo piano, etc. Prepared by The Site Bakery., a division of RIAFox, Inc. The Book of Mormon Geography © 2019. All Rights Reserved.